I'll Bite: Mama said there'd be days like this . . . It just goes to show that you can't keep a determined wine fan down: Streets all around uptown were blocked Saturday morning for some kind of walkathon (I can't say which one, because the civic organizers didn't bother to post any signs at street corners). Navigating to Gateway Village for the Charlotte Wine & Food Weekend's Vintner Tasting was like a bizarre form of Lady Pac Man. Good thing I know a few tricks, like the back way into one of the Johnson & Wales parking lots. A quick stop to pick up my glass and wrist badge and I was ready to do some sipping and talking. 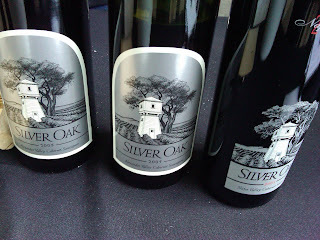 Counting backward, I think this was my 8th adventure at the Vintner Tasting. I've been going since they held it under tent behind Bonterra, through the years under the bandshell at Symphony Park in SouthPark and now, for the few years, in the atrium at Gateway. Held every other year, it's my kind of event: 30 or 40 wineries, each pouring anywhere from three to six wines, some of them being poured by the people who made them. This year, they added a small craft beer section, and many of the wineries had handy sheets listing the wines being poured and their retail prices. Now, there's no way you can taste as many wines as they have available. Even spitting, it would all just run together. The trick to mass tastings like this is to have a plan. Walk through quickly and make note of all the wineries, then pick a few to concentrate on. (Just wait, Silver Oak -- I'll get to you in time.) Some years, I concentrate on kinds of wines -- zins, roses, rieslings. This year, I found myself being pulled toward pinot noirs, starting with King Estate, including its more bargain-priced Next and Acrobat lines. Interestingly, Next, in the $18 or lower range, showed better in a quick taste than the mid-priced Acrobat. I did find two nice roses, one of my favorite summer wines. Eric Solomon's European Cellars was pouring Janasse from Rhone, France, well-priced at $12.99, and Josh Hackler, the young and eager importer from Spanish Vines, had the almonst fuschia-colored Enate Rosado, available at Dean & Deluca and Winestore for about $20. After making my way through Maison Joseph Drouhin's pinot noirs, Vineyard 29's 2007 cru cabernet, and rubbing elbows with an enthusiastic merlot fan at the Robert Foley table, I ended where I usually try to end at the Vintner Tasting: At the Silver Oak table, savoring a mouthful of the '05 Alexander Valley cab: leather and tobacco wrapped in soft, silky texture. $70 a bottle. And worth every penny, especially the $35 ticket to the tasting. A lovely cause, in that case. But I do wish the city would find better ways to give directions when huge sections are shut down for events.